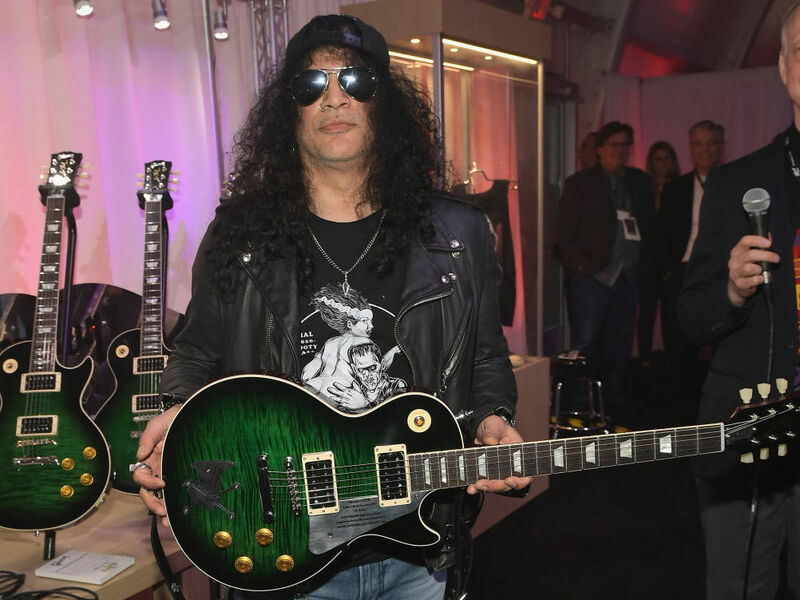 Guitarist Slash shows off a new Gibson instrument in Las Vegas in January. As NPR has noted in the past, filing for Chapter 11 protection does not mean that a company is doomed to fail; instead, "it's a way for companies that can't pay their bills to not die." The petition, filed on Tuesday, notes that the company currently has up to $500 million in debt and will focus its operations on its musical instruments business, "unburdened by the challenges experienced by [the company's] separate, primarily non-U.S., consumer electronics business." That business includes the brands KRK, Cerwin Vega and Stanton, whose lines include studio monitors, headphones and turntables. Gibson also currently holds a majority equity interest in TEAC, a Japanese home audio electronics company. Gibson's turnaround plans include giving some of the company's lenders equity ownership, while its lenders have agreed to an operating loan of up to $135 million to keep the company afloat. The company sells over 170,000 guitars annually in more than 80 countries and says that it sells over 40 percent of all electric guitars costing more than $2,000. It operates guitar-making factories in Nashville and Memphis, Tenn., and Bozeman, Mont.